Death Track: Resurrection is a racing/action title that takes players into a post-apocalyptic, not-too-distant future where traditional sports have been replaced by far more violent entertainment. The main event, The Survival Race, is a deadly combat racing tournament that draws the world's best drivers to compete in spectacular road battles with powerful, weapons-laden hot rods. Gamers will drive, battle and try to survive in races that take place in twisted future versions of the planet's biggest cities. Combat racing across post apocalyptic versions of 10 major cities: Bangkok, Vatican City, London, Moscow, New York, Paris, Prague, San Diego, Istanbul and Tokyo. Destructible environments add to the chaotic destruction surrounding each race. 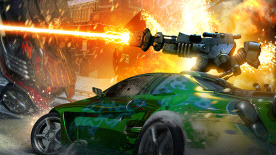 10 powerful car models, customizable with multiple weapons, upgrades and paint jobs. Thrilling suspense story drives the single-player narrative.